Italian pianist Giovanni Bellucci's not one to shy away from the grandest challenges of the Romantic piano repertoire. His debut recording coupled Busoni's transcription of Liszt's Fantasy and Fugue on 'Ad nos, ad salutarem undam' and Beethoven's 'Hammerklavier', followed up by a disc of Liszt's Verdi and Bellini paraphrases. Not only has he subsequenty recorded Liszt's transcription of Symphonie Fantastique (for Decca) but is currently touring with a work that for many represents the apogee of late Romantic pianistic extravagance: Busoni's Piano Concerto. It's the spirit of Busoni which informs his Beethoven cycle, taking in not just the sonatas but Liszt's transcriptions of the symphonies. Bellucci subscribes to Busoni's idea that any performance of a work is in any case a transcription of sorts and thus argues that Liszt's ingenious versions – among the most respectful of all his transcriptions – represent translations; they are different, yes, but a genuine attempt to communicate the same musical essence. These recordings have taken a slightly round-about route, the first disc appearing first on French label Assai and the others were taped initially for Opus 106, before finding a home now with Lontano (part of the Warner stable). Lets hope the project's found a permanent home because this is a treat for pianophiles as well as anyone after a new spin on some well-known Beethoven. In Bellucci's magnificent performances the juxtaposition is fascinating; such is his authority and commitment as a performer that it hardly seems incongruous to mix 'originals' with transcriptions. In fact, with the first three discs on review here, we only have two symphonies: the fifth and the seventh. The seventh is coupled on volume one with the 'Tempest' Sonata and the G major Sonata Op. 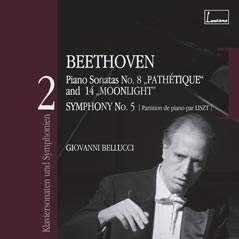 14 No.2; on volume two the fifth is preceded by the 'Pathétique' and the 'Moonlight'. The third volume couples the 'Les Adieux' and the F major sonata Op.10 No.2 with the mighty 'Hammerklavier' Op. 106, perhaps positioned as a Symphony manqué. 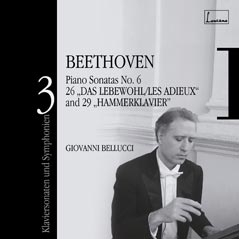 The very ambition of Bellucci's project seeps through into his playing which captures the whole spectrum from impish humour (such as in the G major sonata's Scherzo) to herculean strength that struggles but ultimately succeeds in capturing the elemental energy that pulses through the two symphonies. He's probably at his very best, though, in a magnificent account of the 'Hammerklavier': the opening Allegro bristles with power, he sustains the emotional intensity across the vast Adagio and rattles off the Finale at some speed, with the most astonishing dexterity and clarity. Of his readings of the 'favourite' sonatas, it will probably be the 'Moonlight' that will raise a few eyebrows. The famous opening movement is very much on the slow side as is, perhaps more surprisingly, his very leisurely central Allegretto. However, Bellucci's control is exemplary and the result is almost hypnotic; speed junkies will in any case be more than satisfied with his furious account of the finale. The 'Pathétique' is a touch eccentric, too, an almost static Grave countered by an Allegro di molto which, to my ears, lacks the requisite muscularity despite some dazzling dexterity; and I was not convinced by his slower tempo for the second subject, with strongly accented interjections. Bellucci's Adagio is exquisitely turned, though, and the Rondo provides a bracing romp to the finish, despatched with wonderful sleight of hand. In the other sonatas, Bellucci again mixes a beguiling lightness of touch with slightly unpredictable tempo choices. As such, the first movement of his 'Tempest' is fast, urgent and light on its feet, and I particularly like his contrast between the staccato bass ideas and the plangent melody and the almost imperceptible hush he brings to the central 'recitative'. He despatches the early F major sonata with delightful joie de vivre and captures all the moods of 'Les Adieux', strongly characterised. It's without doubt with the two symphonies and the symphonic-scaled 'Hammerklavier' that Bellucci's achievements take on a more awesome character. In the fifth symphony, there are some passages in the opening allegro where, quite simply, the piano just doesn't sound up to it: not Bellucci's fault. His command of sonority in the slow movement – separating melody from increasingly complicated accompanying figures – is masterly, a skill shown to perhaps even greater effect in the seventh's wonderful Allegretto. The Scherzos and Finales of both symphonies are performed with power and precision; with admirable clarity Bellucci pushes the piano to the limits but keeps the music under control, maintaining an attractive piano sound where others might simply buckle under the pressure of so many notes. 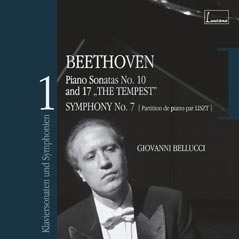 The dance-like rhythms that pervade the seventh come across particularly well and the percussive clarity of the piano, while making the first movement's Poco sostenuto a virtual impossibility, gives the music an inexorable sense of forward propulsion. Refreshing, occasionally idiosyncratic and unpredictable playing, then, that further bolsters Bellucci's reputation as a pianist both deeply musical and fearlessly virtuosic. I understand he plans to record the ninth with chorus and soloists – not part of Liszt's transcription – that might prove to be the most interesting release in what looks set to be a mightily impressive achievement.